Dutton Labs has done all light music enthusiasts incredible service with their constant issues of music from the golden days of this genre. Arguably the greatest beneficiary has been Robert Farnon with over 6 CDs to his credit on the Vocalion label. This latest issue provides two ten inch LP's and one full length LP dating from the early 50's. 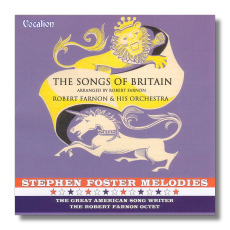 'The Songs of Britain' is vintage Farnon with those wonderful melodies from British folklore coming to life in the gorgeously orchestrated arrangements. 'The British Grenadiers' is particularly enticing and will definitely bring back many memories to those who attended Queen Elizabeth II's Coronation in 1953 for which this LP was released. We cross over to the United States with some tasty 'Stephen Foster Melodies' and the more placid sound of the Robert Farnon Octet. The dreamy sounds of 'Deep River' and 'Sweet and Low' make for some lovely listening and the 1949/50 recording is excellent for its age. Finally, Vocalion provide us with a delightful selection of vintage melodies from Farnon's exhaustive orchestral output. 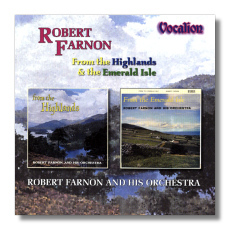 These works have appeared many times over on various compilations but this one is one of those that demands listening as it comes from the rare early years of Farnon's career.